Why Choose File Savers to Recover Your IMPORTANT Data! Fastest Service: 24/7 Emergency Service available so we can have your data back in your hands fast. Beyond Certified: Going above traditional training to solve the most complicated situations. Trusted & Secure: HIPPA & PCI compliant so you can trust your data is always safe and secure. ISO 5 Clean Room: So dust and debris won't enter your HDD's during the recovery process. Custom Tools & Techniques: Propriatary tools & techniques to help us recover data others can't. Highest Success Rates: We wont stop until we have exhausted all solutions to recover your data. RAID 0+1: If drives 1 and 2 fail, you will still have access to your data. If 1 & 3 or 2 & 4 fail, your down you will no longer have access to your data. RAID 10: If drives 1 & 3 fail, you will still have access to your data. If 1 & 2 or 3 & 4 fail, your down and you no longer have access to your data. When your RAID 0+1 server fails and you lose access to your data its important that you make the correct decisions to ensure the best chance of recoverability of your important files. While there are a few things you can try to do, we recommend that you shut the server off and stop making attempts to recover your data yourself. It's to easy to make a simple mistake that can destroy your data! What happens if you lose your data forever? Our trained RAID engineers have recovered data from virtually every type of RAID setup and RAID failure. We have the tools, training and experience to recover your RAID 0+1 fast and safe so you can be back up and running quickly. RAID 0+1 is a nested array of hard disks that include a set of striped drives that mirror over to an identical set of striped drives. 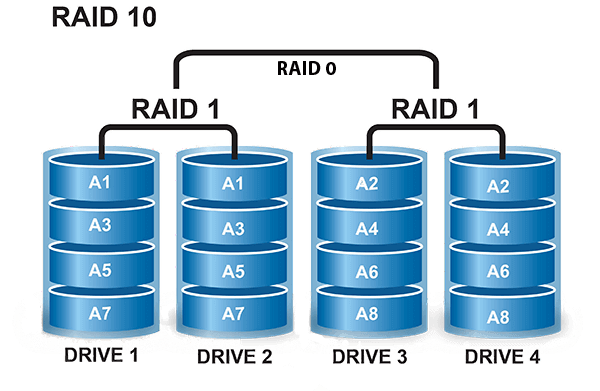 RAID 0+1 systems are usually setup in 4 drive sets but they can contain more drives depending on the RAID controllers capabilities. 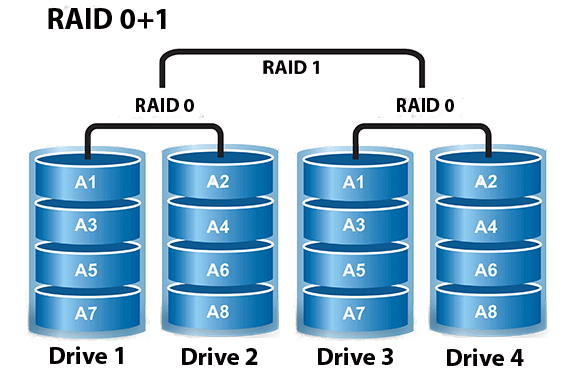 This is different than RAID 10 in that RAID 0+1 allows for both drives from a single set to fail consecutively and the user will still have access to their data. You can also have 1 drive fail from each set but if the wrong two drives fail out of each set, you will no longer have access to your data.